We had a few minutes of minor excitement here yesterday morning when the FedEx delivery person bent down to leave a package, suddenly jumped back and screamed. 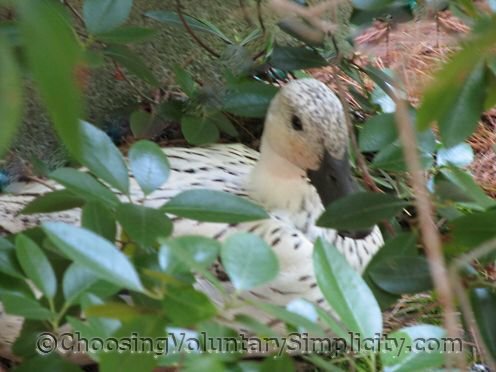 Obviously she wasn’t expecting to see a little white duck sitting serenely under the rhododendron bush just inches away from where she had placed the package! 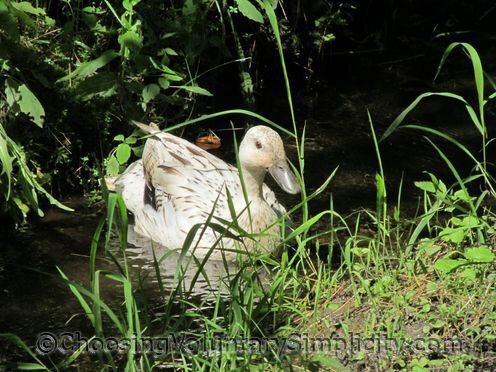 A duck so relaxed and so close to the house was a surprise to us too… but apparently we now have a whole family of ducks in and around our small ponds and the surrounding areas. We have heard ducks off and on for at least four days, but yesterday was the first time we have seen them… a very large male and a somewhat smaller female with several half-grown babies. They’re all great fliers, but between flights they seem quite happy paddling around in the water or just settling down in the shade under the large ferns. They’re a pretty noisy bunch… the babies especially seem to have a lot to say… especially in the late evening and early morning!